I usually share these photos on my Facebook page but I just realised that this means that some of my lovely readers are missing out! So I am going to make sure I post here as well. An updo for a family wedding event. Basket weave to the rear, flat twists to the side and pompadours to the crown, finished with a side sweeping fringe to help obscure areas of sparsity. 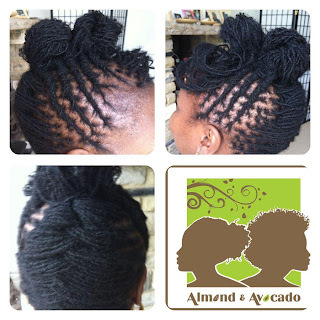 All hairstyles are created GENTLY meaning I never pull tightly or cause pain. Isn't it about time you treated yourself to an Almond & Avocado experience?